Haley performs a physical exam on her patient. 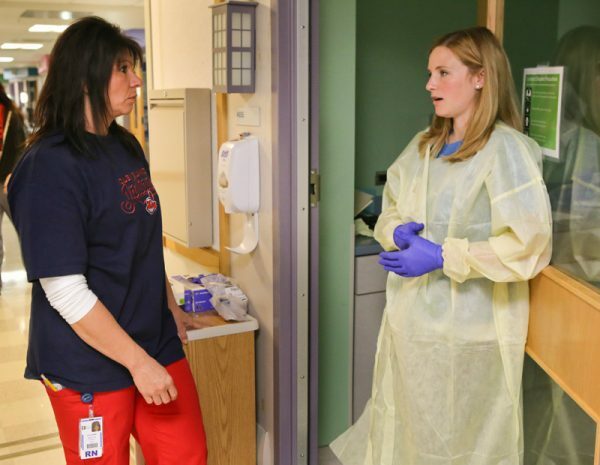 Haley MacEwen may not be a mother yet, but she gets plenty of practice caring for children as a part-time float nurse at Akron Children’s. 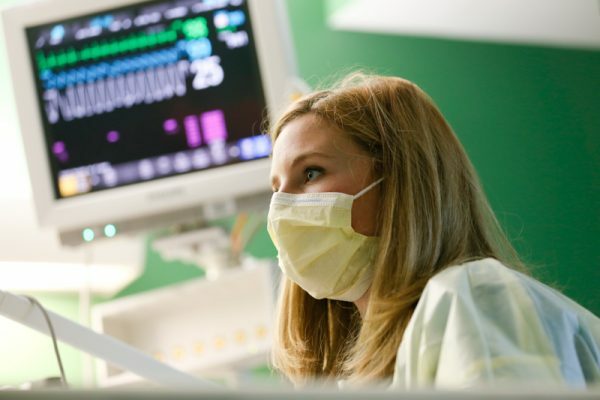 Pregnant with her first child, who is due in March, today she has been assigned to care for a 9-month-old patient in the pediatric intensive care unit. Haley’s job is to watch her young charge’s vital signs, monitor his urine output and continuous tube feedings, administer medications, re-position him, and make sure he stays sedated so he doesn’t pull out the tube down his throat and potentially damage his airway. 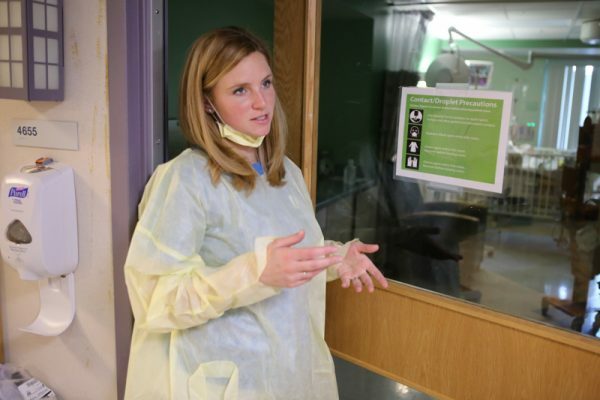 As a member of the float pool, Haley reports to huddle at 7 a.m., where the bed control nurse goes over how many nurses are needed in each area during that particular shift. Today 3 float nurses are needed in the PICU and 3 more in the NICU. “Once we hear about assignments we are allowed to decide among ourselves which assignment we’d like to take,” said Haley. 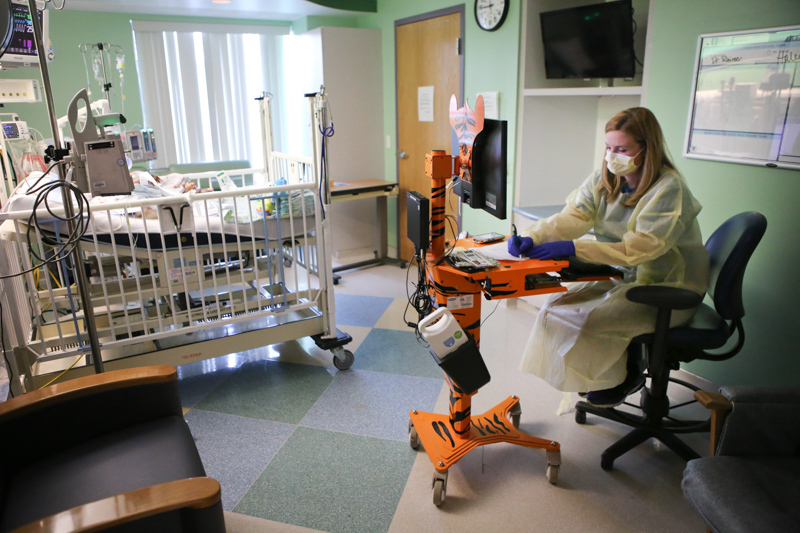 Haley must wear a gown and mask when entering her patient’s room to help prevent the spread of germs. Growing up in the Akron area, Haley has a long history with Akron Children’s. As an injury-prone child, she was a patient multiple times. Haley knew at a young age she wanted to work with kids – originally imagining a career as a physical therapist. Eventually grad school came calling anyway. Haley is currently a student at the University of Akron pursuing her master’s in nursing and pediatric nurse practitioner certification. “Ultimately I knew I wanted to go back to school to advance my career, but I wanted to do it on my own terms and when the timing was right for me,” she said. Haley checks the vitals of her 9-month-old, intubated patient. Using the hospital’s tuition reimbursement plan, Haley takes 3 to 4 classes a year to maximize the hospital’s $5,250 tuition benefit per calendar year. Her out-of-pocket costs are minimal. 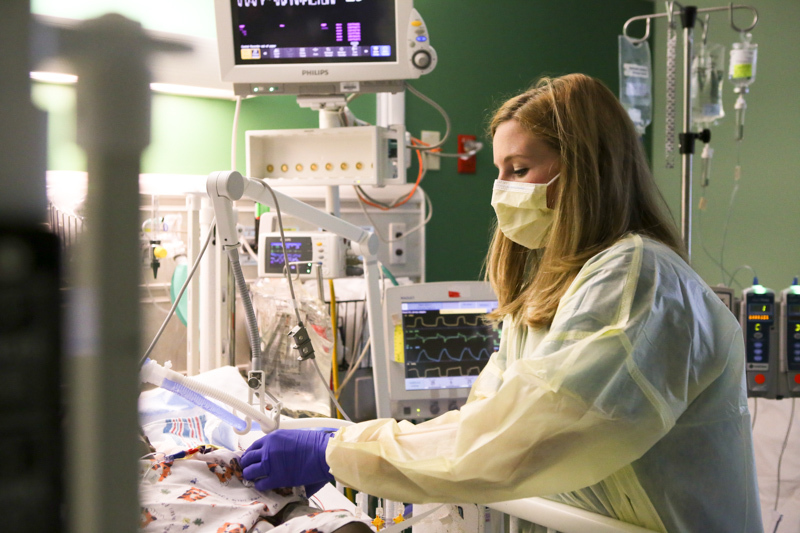 After working as a nurse tech and then a staff nurse in the NICU, Haley joined the float pool in 2014. She enjoys the diversity being a float offers her. Float nurses generally work a 12-hour shift and can be moved elsewhere if needed – including different units or to other Akron Children’s facilities like the Beeghly campus or the special care nurseries at Summa Akron City, St. Joseph’s and Wooster. Haley reviews the plan of care for the day. A self-described jack-of-all-trades, Haley says it can be harder acclimating on units she doesn’t work in often. Today she confers with resource nurse Colleen Manzo, who runs to the med and supply room for Haley since she cannot leave her patient. Although she is scheduled just 2, 12-hour shifts per week, there is the opportunity to work more if she desires. “With only 70-80 nurses in the float pool between all Akron Children’s locations, I can pick up extra shifts whenever I want. There is always a need,” she said. Haley asks PICU resource nurse Colleen Manzo for supplies. The not-so-distant future holds quite a few personal and professional changes for Haley. As for the unknown – Haley and her husband have elected to be surprised about whether they are having a boy or girl. If you’d like to learn more about how you can make a difference for children and families, visit our job board or follow us on Twitter. Learn more about educational benefits available to employees.